(PRLEAP.COM) December 12, 2016 - ExploreTraveler, a global tourism marketing company (www.exploretraveler.com), announced today that it has officially launched a new podcast. 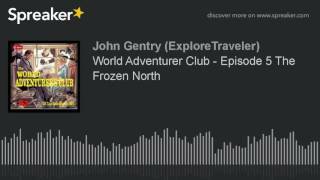 According to John Gentry, ExploreTraveler co-founder, the new podcast and brand refresh are more closely aligned with the company's strategic vision for growth and expansion over the next decade, and beyond. With the growth of the mobile phone market, and the popularity of podcasts we have added, and grown our free audio offerings. iTunes has helped us grown and distribute our podcasts free to the public, and too help spread the world of sustainable tourism. Our program is two fold with our original podcast, and non copyrighted travel show's from the early 1900's. These shows help to educate, and to entertain our listeners all around the world. We encourage our listeners from around the world to add a review to our iTunes channel, and help us spread the word around the world.